Clean and cut the chicken fillet into small pieces. Heat 1 tablespoon cooking oil, add egg and stir it. Heat 3 tablespoon oil, garlic and add the chicken. Cook until the chicken done, add mushroom. 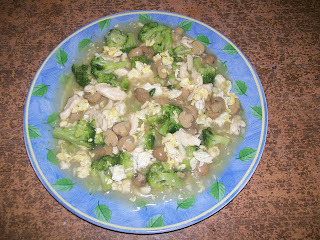 Then, enter the broccoli and egg. Add salt , sugar, oyster sauce and sesame oil to taste. Cook briefly until the sauce is quite jell. Chicken and Mushroom (Ayam Jamur) is ready to serve.